You will fight with armies, sorcery and intrigue to make your kingdom the most powerful of its age. This interesting and involving strategy game, by the creators of by War of the Ring and set in Robert E. Howard’s world of Hyboria, is very satisfying and strategic once you get to know all its little rules quirks. 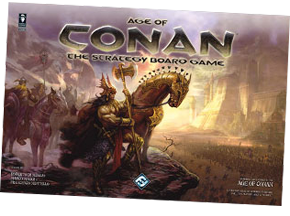 Eschewing a standard turn sequence, the game is divided into three Ages, each of which is further divided into four of Conan’s adventures. While Conan completes his adventures (tracked by adventure cards), the players engage in conquering neighbouring provinces via military might and ambassadorial intrigue. Additionally, a bidding round decides who gets to control Conan during each adventure, and it can be greatly advantageous to have him on your side in both war and diplomacy. Age of Conan really is a must for War of the Ring fans. The games share a similar mechanic in the use of fate dice: these have special icons which allow players to choose from various actions. But the two games have a very different feel. Their main similarity is the way these game designers manage to seamlessly blend the macro actions of army movement and conquest with the micro actions of characters and their adventures, and they’re quite unique in this respect. I highly recommend another look at Age of Conan—save yourself some grief by downloading my rules summary and reference sheet and you’ll find the rules quite easy to get your head around. It’s also a stunning looking game that comes with 168 very nice plastic figures—including Conan himself of course. While you struggle to “crush your enemies and see them driven before you”, Conan adventures throughout the land, occasionally sticking his big broken nose into proceedings. Years later, Ares acquired the game and ran a Kickstarter campaign to add an expansion called Adventures in Hyboria and fix an oft-cited criticism of the game: that Conan himself doesn’t have enough to do (of course it was also a clever way to move the old stock of the original FFG print run of the game!) The expansion took a while to deliver, but the game is now finally rich with Conan adventuring and development as well as military conquest – at the cost of some added complexity. As there are more than 3 spies for each kingdom. Thanks for these, they are great as always! Thanks mate, I’ll put that in asap. I played this recently and I really need to put some additional stuff in this summary to make the game flow more effectively. There are numerous little processes like you mention that make it tricky to play. I love the gameplay despite (or because of) all the tricky little processes, but with the expansion we’ve been encountering this strange issue, where Conan’s experience seems out of whack with the rest of the game. I’ve posted about it in the forum. Did you put that piece about advancing the mood wheel into version 3? Can’t see it. Oh, thanks a million Ralf, I forgot it again! Now added.